Whether you’re a freelancer or a CEO, the look and feel of your workplace matters. But when you’re busy juggling meetings, deadlines and budgets, office design can be overlooked. Research has shown that the characteristics of an office can have a serious impact on the behaviour, perceptions and productivity of workers; satisfaction with the work environment has been directly linked to overall job satisfaction too. Productivity is all about getting the job done in the most efficient way possible; unmotivated employees and high turnover rates will undoubtedly affect your business, because they impact the day-to-day running of it. AT LABS, our offices have been designed with these things in mind, so that teams of all shapes and sizes can get as much out of their working day as possible. Here are some key design elements that will improve performance in the workplace. Once upon a time, offices featured cubicles or partitioned workspaces that hindered communication, and enforced the idea that workers were merely cogs in a machine. It’s rare that you see cubicles in corporate offices nowadays; they’re considered soulless and impersonal. Open-offices have become the norm for many – and there are plenty of good reasons for this. Barriers between managers and their subordinates are dismantled in an open-plan office environment, making individuals feel like they’re part of a team. This set up encourages collaboration and builds relationships between a workforce. Open-plan offices are also easier for businesses to set up; they maximise on space and reduce running costs too. But whilst there are lots of benefits to working in an open-plan office, there can be more distractions in a communal setting. According to architectural design firm Gensler, ‘workplace strategies that sacrifice individual focus in pursuit of collaboration will result in decreased effectiveness for both.’ A frustrated employer who’s unable to focus on their individual tasks won’t succeed at working collaboratively either. Well-designed offices house a number of different spaces for people to work in. If employees are finding that their main workspace is too noisy, there should be an area on-site where they can retreat to. This might be a meeting room, a booth or pod, a canteen or simply a quiet seating area close by. Today, innovative businesses – especially those in the tech sector – are offering ‘unprecedented levels of freedom for their staff to modify their workspaces,’ says Gensler. And it’s this kind of flexibility that will really improve productivity. People’s needs and ways of working are unique; good office design taps into this, and will cater to a range of working styles under one roof. Offices should be flexible and spacious. According to the Workplace (Health, Safety and Welfare) Regulations 1992, each employer should have at least 40 square feet to work in. Cramped, disorderly conditions don’t make for a happy workforce. Office workers spend the majority of their working day sat at a desk, but the health implications of this are well-documented (experts recommend that you should stand for 15 minutes every hour). Offices should be laid out so that team members can move around freely; taking brief but regular walks throughout the day is vital for their health and wellbeing. Regular exercise, however light, releases serotonin (the ‘happiness hormone’) and boosts morale; it’s also known to lessen our chances of getting ill (which means fewer sick days). Additionally, exercise increases blood flow to the brain, which keeps us alert and boosts energy. And studies have found that brief diversions from a particular task will actually improve our engagement with it. Working for long periods without breaks can make our brains perceive a task as less important, so we start to lose concentration. Furniture should be set out so that employees can walk around their office with ease; floors ought to be free from clutter too. Any office that’s spacious will also have enough storage space. If people are forced to use their desks to store excess papers and office equipment, they’re likely to feel hemmed in and waste time finding misplaced items. One survey found that 66% of participants spent up to 30 minutes a week just looking for things at their desks or around the office; every year, each worker loses around 38 hours (or one working week) searching for these items. Help your employees to de-clutter their workspaces with storage furniture; under-desk drawers or filing cabinets, cupboards and lockers all help to keep desks and floor spaces clear. Technology has dramatically changed the way we work. Multiple screens and wireless connectivity are standard in offices today; video conferencing technology and interactive whiteboards are common features of modern meeting room design. Businesses should make it easier for their employees to engage with these technologies, but it’s important that they’re promoted (and used) as a tool – and not as additional distractions. Technology in an office should always have a purpose and help to make life easier for employees. Specialised software and apps (like the LABS app) can help to streamline workflow and day-to-day efficiency; if you can book a meeting room in just one click, for example, workers are going to save time (who else has ever wasted 20 minutes or more trying to find a spare room?). We’re happiest when we’re close to the outdoors; it’s an evolutionary fact. Being outside was essential for our early survival; it meant proximity to food, water and other people. And whilst we’ve moved on from the Stone Age in many ways, nature is still essential for our wellbeing. Studies have suggested that working next to windows helps employees to concentrate on the task at hand and increase their sense of loyalty towards a company. Exposure to natural light helps to regulate our circadian rhythms, which affects our bodies’ functioning (sleep-wake cycles, hormone release, eating habits and digestion are all linked to our circadian rhythms). If views aren’t available, simply being reminded of nature is enough. Researchers at the University of Exeter found that office plants can increase productivity by 15%. Staff reported feeling happier with improved levels of concentration when they worked in a ‘green’ office. And because plants reduce CO2 and bacteria levels, they felt better about the air quality in their workplace too. Potted plants, outdoor terraces and large windows all help to bring the outdoors in; office furniture with natural finishes like wood or stone can be used to make employees feel like they’re closer to nature too. Though we may not notice it, colour can have a big impact on how we think and feel. ‘Colour psychology’ is used to determine which hues affect human behaviour. Certain colours – and vitally, their intensity – can make us more productive, whilst others will negatively impact our mood and thinking. Neutral and blue shades are supposed to improve concentration; green has a balancing effect and yellow apparently stimulates mental activity (though weirdly, it’s also meant to remind people of food!). Modern offices tend to use a combination of bold and neutral shades for a harmonious finish. It’s important to remember how you’re using colour too, because it plays an important role in influencing large or small spaces. A long, narrow room will seem more balanced if the end walls are painted in a warm but intense colour; a low ceiling will feel oppressive if it’s painted in a dark grey, blue or black. Whether you’re in a corporate office, a co-working space or at a dedicated desk, it’s important that your workplace is set up to make you feel happy and productive. 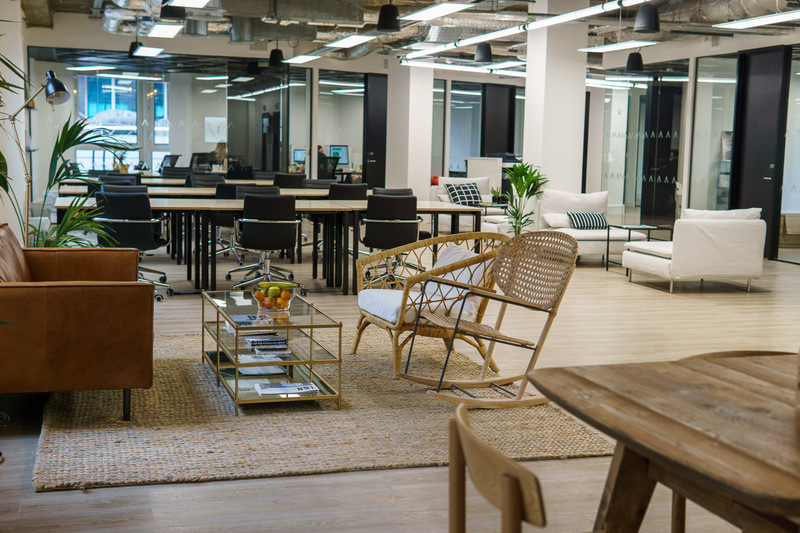 Even small changes can make a huge difference to your mindset; feel more motivated, creative and content by choosing a well-designed office space.